Parts List Drinking Bowl – Cap covering the unit’s tube that also serves as the bowl from which the animal drinks. Paddle – The lever inside the drinking bowl that the animal pushes to activate the water coming up from the valve. Cable – The cable is attached to the paddle and down to the valve arm. This activates the main valve. Fill and Drain Pipe – The long grey pipe that runs nearly the whole length of the inner unit. The water fills and exits using this pipe. Insulator (for insulated Units) – The black round disk that is located between the drinking bowl and valve assembly. Union – The junction fitting found just under the round black insulator and just above the valve asssembly. Its purpose is to connect the valve assembly with the fill and drain pipe. The union also allows access to the internal filter. 4″ Pipe – This 4 inch piece of pipe connects the union to the “t” which connects the valve assembly. “T” – The T connects to the 4″ pipe to the drain pipe and to the main valve. Valve Assembly – The metal platform on which the valve and water flow mechanisms rest. Main Valve – This is the unit that brings water in from the waterline up to the drinking bowl and has a grey arm attached to it. The cable is attached to this grey arm. Main Valve Washers – These are the washers inside the main valve that re attached to the grey arm. 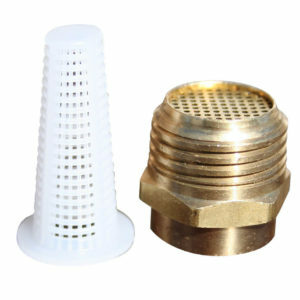 Drain Valve – The small brass fitting at the end of the main valve assembly that directs the water flow in and out of the drinking bowl. Red Handled Water Valve – Off and on valve for water coming into the system. Found on the coiled hose below the unit. All automatic waterer system parts come with warranty, order your automatic waterer system parts today.